Teach baby to swim since the first year has many benefits. Not only beneficial for babies, swimming can improve the parent-child bonding. According to a study from the University of Science and Technology in Norway, babies can swim proved to have a better balance, and can reach around objects more easily than infants who are not swimmers. Water Babies surveys conducted showed that 40 percent of parents in the UK claimed never to expect any positive benefits, from teaching swimming to babies. Though the third highest accident in children in the UK due to drowning child. Teach swim early on, it can improve self-esteem in the water, and allowed him to protect himself. Swimming with the baby into a fun moment for kids and parents. Besides thrilling, swimming with baby also increase parent-child bonding. Activities swim practice physical and mental development of children. Children not only grow fitter and stronger, but it also helps children to better appetite and sleep more soundly. In fact, the pool is not just a physical exercise. Through swimming, baby can also learn life-skills, including the ability to survive and maintain themselves. According to the survey, 90 percent of fathers and mothers agreed that their responsibility to ensure their children have a life-skill. That is, it is the duty of parents to educate and guide children untukmemiliki life-skills such as the ability to swim, bike, understand ethics at the dinner table. However, more than a third claimed commitment to foster life-skill is unbeatable because of busy work. Paul Thompson, co-founder of Water Babies said, "Teaching children about the basic level of security and confidence in the water in the water can save him. Through progressive training, babies can learn self defense skills from an early age, such as swimming approaching solid objects while are in the water, and so forth. " 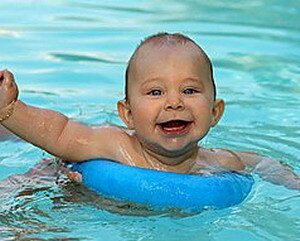 Most parents, survey respondents Water Babies, said children should begin to learn to swim from the age of three. But in fact, children can learn to swim early again. Infants in the first year had a higher brain development, any movement will stimulate brain development, strengthens the nerves and makes the brain work more efficiently.